Be the first to share your favorite memory, photo or story of Krystal. This memorial page is dedicated for family, friends and future generations to celebrate the life of their loved one. 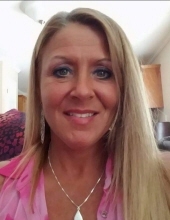 Krystal Gayle Chaffins, age 47 of Versailles, Kentucky, passed away on Monday, November 19, 2018 at Norton Hospital, Louisville, Kentucky. She was born October 8, 1971 in Port Huron, Michigan to Paul Chaffins of Salyersville, Kentucky and the late Molly Greene Chaffins. She was a disabled US Marine. Along with her father she is survived by her Daughter: Daphne Rae (Caitlyn) Tyson; Son: Orie Nathional Eugene Hutchinson; Brother: William Chaffins; Step Sister: Tammy Williams. Along with her mother she was preceded in death by her Daughter: Summer Xzandria Hutchinson. She will be missed by all that knew and loved her. "Email Address" would like to share the life celebration of Krystal Gayle Chaffins. Click on the "link" to go to share a favorite memory or leave a condolence message for the family.